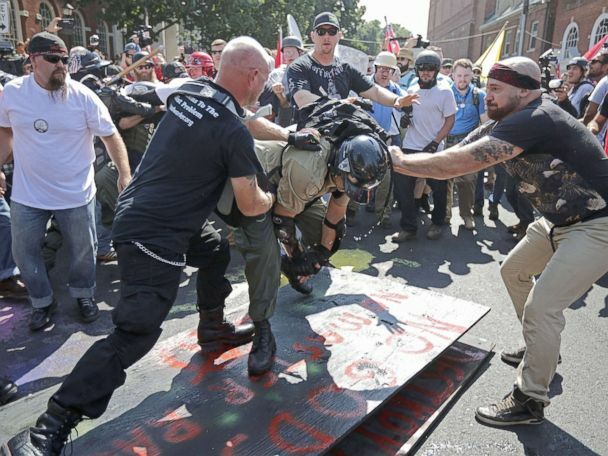 In August 2017, far-right extremists gathering for a "Unite the Right" rally in Virginia clashed with counter-protesters, leaving more than a dozen injured and several under arrest. Shortly after 1:00 p.m. a vehicle driven by a rally-goer struck a crowd of pedestrians in an attack that killed a 32-year old woman and injured 19 others. White nationalists and far right extremists march through the University of Virginia Campus with torches in Charlottesville, Va., Aug. 11, 2017. 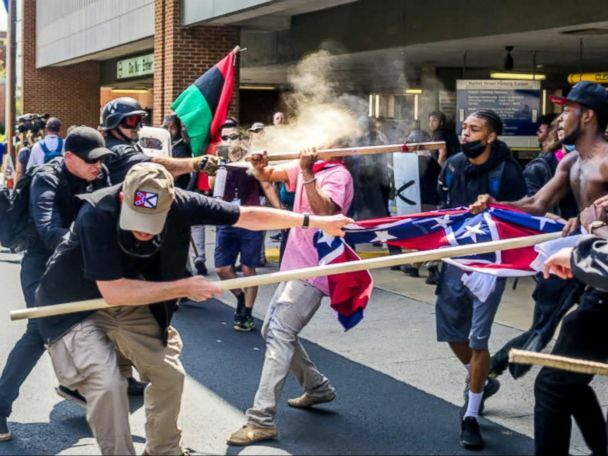 In August 2017, far-right extremists gathering for a "Unite the Right" rally in Virginia clashed with counter-protesters, leaving more than a dozen injured and several under arrest. 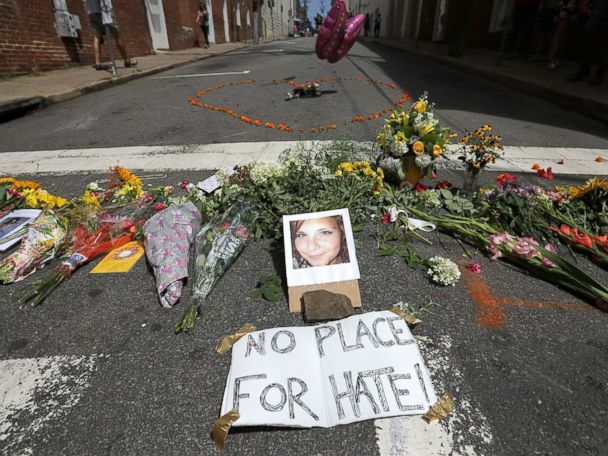 Shortly after 1:00 p.m. a vehicle driven by a rally-goer struck a crowd of pedestrians in an attack that killed a 32-year old woman and injured 19 others.<br><br>White nationalists and far right extremists march through the University of Virginia Campus with torches in Charlottesville, Va., Aug. 11, 2017. Peter Cvjetanovic marches with white nationalists and far right extremists as they encircle the base of a Thomas Jefferson statue after marching through the University of Virginia campus with torches in Charlottesville, Va., Aug. 11, 2017. Virginia State Troopers stand under a statue of Robert E. Lee prior to a white nationalist rally in Charlottesville, Va., Aug. 12, 2017. City Council had voted earlier in the year to remove the Confederate statue. White nationalists clash with counterprotesters in Charlottesville, Va., Aug. 12, 2017. A white supremacist tries to strike a counter protester with a flagpole during clashes at Emancipation Park in Charlottesville, Va., Aug. 12, 2017. A counter protester strikes a White Nationalist with a baton during clashes at Emancipation Park in Charlottesville, Va., USA on Aug. 12, 2017. A woman has a special mixture and water poured into her eyes after being hit with pepper spray during clashes with between White Supremacists and counter-protesters at Emancipation Park in Charlottesville, Va., Aug. 12, 2017. A counterdemonstrator throwing flames from a spray can against white nationalist demonstrators at the entrance to Emancipation Park in Charlottesville, Va., Aug. 12, 2017. Gov. Terry McAuliffe declared a state of emergency and police ordered people to disperse after violent clashes between white nationalists and counterprotesters. White nationalists and members of the so-called "alt-right" at a Unite the Right rally are engaged in violent clash with counterprotesters on Aug. 12, 2017, near Emancipation Park in Charlottesville, Va., where the City Council earlier this year voted to remove a statue of Confederate Gen. Robert E. Lee. After the clashes, police declared the gathering unlawful and ordered crowds to disperse. A Twitter post by the Virginia State Police announces the state's legal definition of "unlawful assembly" in reference to protests in Charlottesville, Va., Aug. 12, 2017. The picturesque Virginia city was the site of a white nationalist demonstration and counterprotest. Anti-fascist counterprotesters wait outside Lee Park to hurl insults as white nationalists, neo-Nazis and members of the "alt-right" are forced out after the Unite the Right rally was declared an unlawful gathering, Aug. 12, 2017 in Charlottesville, Va.
White supremacists stand behind their shields at a rally in Charlottesville, Virginia, Aug. 12, 2017. White nationalists, neo-Nazis and members of the "alt-right" clash with counter-protesters as they enter Lee Park during the "Unite the Right" rally, Aug. 12, 2017, in Charlottesville, Virginia. 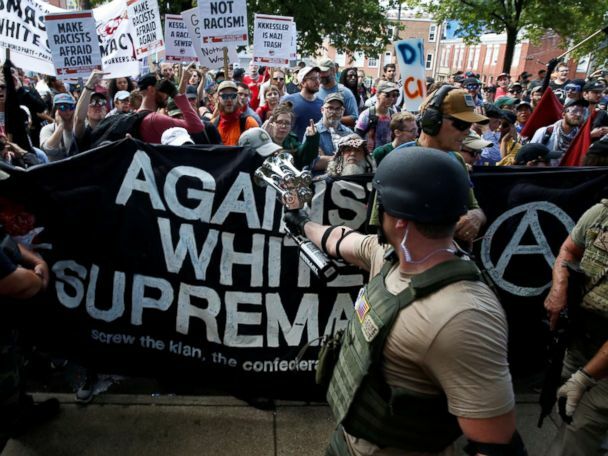 <br><br>After clashes with anti-fascist protesters and police the rally was declared an unlawful gathering and people were forced out of Lee Park, where a statue of Confederate General Robert E. Lee is slated to be removed. National Guard were called, and a state of emergency declared, into Lee Park in Charlottesville, Va., Aug. 12, 2017, after a protest by the alt-right and white supremacists turned violent. A vehicle drives into a group of protesters demonstrating against a white nationalist rally in Charlottesville, Va., Aug. 12, 2017. People fly into the air as a vehicle drives into a group of protesters demonstrating against a white nationalist rally in Charlottesville, Va., Aug. 12, 2017. A gray car plows into pedestrians and vehicles, Aug. 12, 2017, in Charlottesville, Va. The driver hit the knot of cars and people at high speed, then backed up and fled the scene. A woman on a stretcher cries after a car plowed through a crowd of counter-demonstrators marching through the downtown shopping district in Charlottesville, Va., Aug. 12, 2017. People receive first-aid after a car ran into a crowd of protesters in Charlottesville, Va., Aug. 12, 2017. Demonstrators gesture in response to the Charlottesville, Virginia car attack on counter-protesters after the "Unite the Right" rally organized by white nationalists, in Oakland, California, Aug. 12, 2017. People participate in a candlelight vigil outside the White House to show solidarity with the victims of the violence that took place at a white nationalist rally in Charlottesville, Vir., AUg. 12, 2017, in Washington, Aug. 13, 2017. </br></br>Rallies were held across the United States to demonstrate opposition to the violence in Charlottesville. People gather in front of the White House, Aug. 13, 2017, in Washington, for a vigil in response to the death of counter-protestor Heather Heyer in the Aug. 12th "Unite the Right" rally that turned violent in Charlottesville, Va.
Mourners and passersby surround an impromptu memorial of flowers and chalk notes written on the street commemorating the victims at the scene of the car attack on a group of counter-protesters during the "Unite the Right" rally in Charlottesville, Virginia, Aug. 14, 2017. People observe a moment of silence during the memorial service for Heather Heyer outside the Paramount Theater, Aug. 16, 2017, in Charlottesville, Va.
A white supremacist saying he's ready to die for his convictions and a political activist saying he's exposing evil were at an event that ended with one woman dead and at least 19 injured.